We’d love your help. Let us know what’s wrong with this preview of On to Mars by Robert Zubrin. In 1998 Dr. Robert Zubrin brought into being the Mars Society, and thousands of people from around the world have flocked to his banner. People from all walks of life have shown support for the exploration and colonization of Mars. Each year the Mars Society holds its annual conference, when experts and enthusiasts can meet to present and exchange ideas and information. Fr In 1998 Dr. Robert Zubrin brought into being the Mars Society, and thousands of people from around the world have flocked to his banner. People from all walks of life have shown support for the exploration and colonization of Mars. Each year the Mars Society holds its annual conference, when experts and enthusiasts can meet to present and exchange ideas and information. From the first four years' conferences have been chosen a wide variety of the many papers presented, and then collected together in one volume. The included CD-ROM contains 60 more papers as well as a half-hour video created specially for this book. The future of mankind lies with the colonization of other planets, and eventually other solar systems, and colonizing Mars is the essential first step. With its ever growing population and dwindling resources, the end of Earth's time as the sole home of humanity is drawing near. In a life where most of us spend the majority of our time in the day-to-day activities of simply surviving, the people of the Mars Society are looking beyond the immediate future to the needs of the human race as a whole. This embodies a definite sense of social responsibility. Although some aspects of exploring and colonizing Mars still need refining and fine tuning, the lion's share of the technology and the understanding of the human condition are already in existence. The major missing factor is simply the realization and the commitment necessary to begin. The people of the Mars Society are working to educate and convince the political powers, the industry leaders, and you and me. We all have a stake in this. 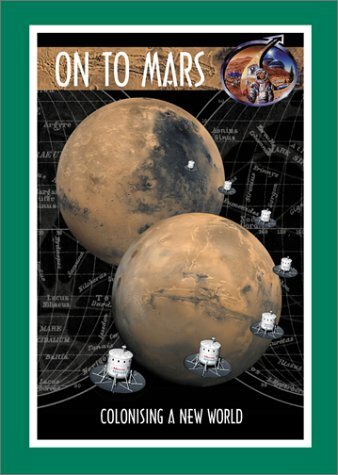 Many of the diverse specializations and concerns of Mars missions are introduced and explained in this book. Members of the Mars Society share with us their ideas, their knowledge, and their dreams, and encourage us to understand and commit to an important undertaking in the future survival of mankind. To ask other readers questions about On to Mars, please sign up. An attempt to put a multi-day, multi-panel conference into book form doesn't really work, given how much it jumps around in topic, trying to cover everything, as well as having disagreeing voices on the numerous subjects. This is a collection of conference papers; some are more interesting than others. It is a VERY slow read.